Snuff powders are used to store tobacco powder for inhalation. The practice of snuffing began in the late 15th century, when tobacco use became popular among Europeans after the discovery of the New World. By the time Charles II was reigning in the mid-17th century, inhaling snuff was popular even among women. 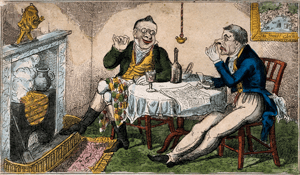 In the early 18th century the nobility began favouring the use of snuff. In the late 18th century, craftsmen began producing decorative boxes intended to keep the powdered tobacco dry between uses. 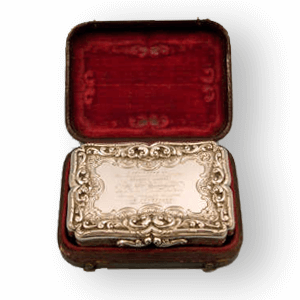 Through the 19th century, the snuff box was an essential personal item for members of all social classes. Silver snuff boxes are the prime surviving examples from that period. Craftsmen used fine metals like silver and gold and other materials like ivory, horn or tortoise shell to create the boxes. The boxes came both in a large size meant for table use, and a small size intended for personal use. The pocket-sized boxes held enough snuff for one or two day’s personal use. Snuff boxes were most often rectangular, but some were shaped like ovals, trunks, or shells. They were sometimes decorated with hand-painted landscapes, portraits, or cameos. The most distinctive snuff boxes were set with fine jewels and engraved or enamelled. Some were inset with decorative shells and mother-of-pearl. Silver snuff boxes were made primarily in Sheffield during the 1700s and others were produced in Birmingham during the late 1800s. Castles, monuments, and abbeys were depicted on the silver snuff box lids and sides. Birmingham craftsmen also created snuff boxes of papier-mâché, then made them strong with enamel layers. After the popularity of snuffing faded, the practice was retained among certain professions where smoking was prohibited, such as mining. Former smokers also favoured snuff and continued to use snuff boxes. The monarchy gifted snuff boxes to ambassadors in honour ceremonies. 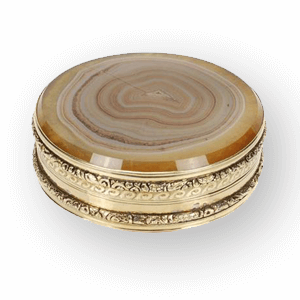 One of the most sought after group of snuff boxes are castle top snuff boxes. These have a view of a famous landmark die stamped onto the top and were made as souvenirs. We can learn more about castle top silver here. Arguably as collectable and valuable as castle top snuff boxes are novelty snuff boxes. 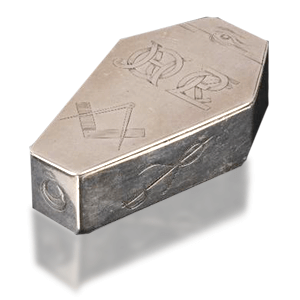 The snuff box illustrated above is a Masonic snuff box and would be worth over £1,000 if it came to market. The more unusual the shape the better. It was quite common to mount silver snuff boxes with a hardstone like agate. The pinnacle of hardstone mounted boxes was the middle of the 18th century when gold, rather than silver, was used to mount precious stones like agate and lapis lazuli. Snuff can damage plain silver, but as gold is inert it resists corrosion. 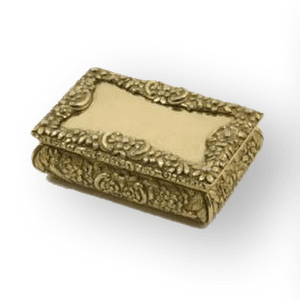 To stop snuff damaging the silver the inside of most snuff boxes is coated with a layer of gold. 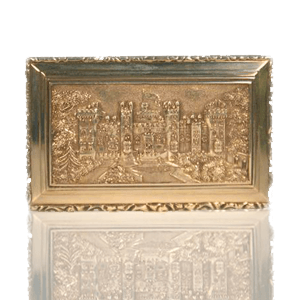 However, sometimes a silversmith would have the entire box gilded and they are very sought after. There are two sizes of snuff box: pocket and table. Pocket snuff boxes are very common and were made for personal use. Table snuff boxes were made to be used communally and are much large. They were often given as presentation items and might have an engraving on which can add value. There was a large number of snuff boxes made in Scotland. The most common are like the one pictured above and are often called snuff mulls. 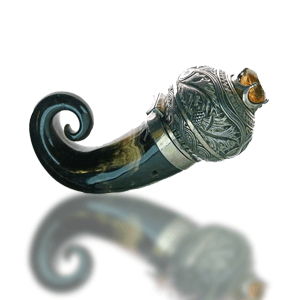 The horn is hollowed out at the top and mounted with a silver clasp. They are quite valuable especially when they have been made by a rare silversmith. If you would like a free, no obligation valuation of your silver snuff box please use the form below. You can also email details about your silver snuff box to [email protected] or call us on 01477 410893.